This tour take you around the exhibition “De la Fractale au Panorama” which took place at the Mairie of Béthemont-la-Forêt from 21st to 28 June 2014. 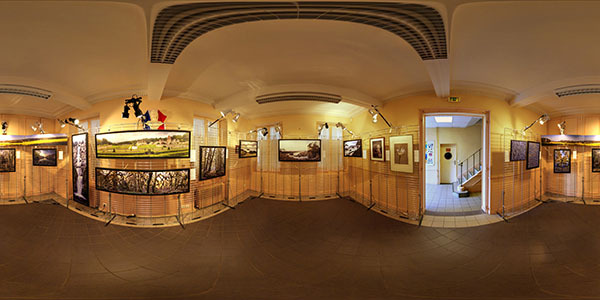 The photographs exhibited range from macro photography to 180° panoramas. Clicking on the camera icon near each photograph will bring you the full image. This spherical panorama comprises 9 images, each of which is bracketed at 0, +3 and -3EV. The images were then stitched using Hugin and then transformed into a multi-resolution panorama with KRPano. The virtual tour was built using Panotour Pro for the basics and then customised with additional xml coding.